Mount Halcon Summit. We were blessed with an awesome weather!!! Seconds after my group SMB Mountaineers posted photos of our Mount Halcon Climb last weekend in FB, I was flooded with inquiries about whom to contact, how much is the guide fee and how much is the climbing permit, etc. 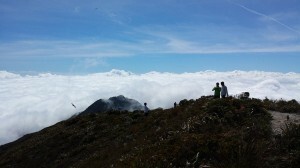 To make things clear let me share to you what YOUR GROUP should do so that you can climb Mount Halcon without hassle. DISCLAIMER: Pinoy Outdoorsman is not an authority whatsoever. The best thing that you can do is to call the Tourism Office in the Municipality of Baco, Oriental Mindoro to inquire how to climb Mount Halcon. We can also recommend a contact person who will process your permit but YOU NEED TO ACCOMPLISH AND PROVIDE ALL THE COMPLETE LEGAL DOCUMENTS. These documents should be “legal and official”. If found to be tampered then you know the punishment. Once the Tourism Office in Baco recieve these document, they will assess and process your permit and they will contact you. On climb day you MUST go to the Municipality of Baco to personally sign your permit and you MUST go to the Police Station to be issued a certificate and they will put you (and your team members) in the blotter list. A short briefing will be done. Make sure to be in constant communication with them as changes are inevitable. TIP: For better success that you will be issued a permit, it is better that you file your documents as a team of not more than 10. If your climb dates happen to have a lot of climbers then you may be required to change your climb dates. As of official word only a maximum of 50 climbers will be allowed in Mount Halcon per climb weekend. Your contact person in Baco (provided by the Tourism Office) will take care of arranging your porter and guide. If you need more information on how to climb Mount Halcon, please call the Tourism Office in Baco Oriental Mindoro or you can send PM so that we can give you the number of our contact person there (I failed to ask if I can publish the telephone number so to be on the safe side I will not post it here).